Travel to see Tampa’s dolphins and other marine wildlife on a 75-minute cruise from the Florida Aquarium into the bustling waters of Tampa Bay. Climb aboard a luxurious 72-foot catamaran and discover Tampa Bay’s fascinating ecosystem. Look for the abundance of wildlife that lives there — bottlenose dolphins, fish, birds, manatees, sea turtles and more — and learn how they thrive in one of the nation’s most diverse seaports, Port Tampa Bay. The use of binoculars on the cruise plus admission to the Florida Aquarium are included. Hop on board the Bay Spirit II, a 72-foot (22-meter), 130-passenger catamaran for a 75-minute eco-cruise to see Tampa Bay’s marine wildlife. Guided by a Florida Aquarium naturalist, this trip will prove to be as educational as it is entertaining. Travel from the downtown Florida Aquarium into the fascinating ecosystem of Port Tampa Bay and see the abundance of wildlife that calls it home — over 400 bottlenose dolphins, a wide variety of fish and birds, plus manatees, sea turtles and more. Discover how these species survive in one of the most diverse seaports in the United States. Dolphins are spotted on 85 to 90 percent of the tours, but viewing them is done in a responsible manner. The Florida Aquarium participates in the Dolphin SMART program, which promotes the safe viewing of wild dolphins by not disturbing their natural behaviors or habitat. Keeping a safe distance and abiding by state and federal protection laws allows the dolphins to go about their day feeding, playing, sleeping — even teaching their babies. There are two restrooms inside the catamaran’s air-conditioned cabin, plus snacks and beverages — including beer and wine — that are available for purchase. The upper deck provides fresh air and a panoramic view during the tour. Bring binoculars to watch the dolphins or choose from the limited supply available on board. 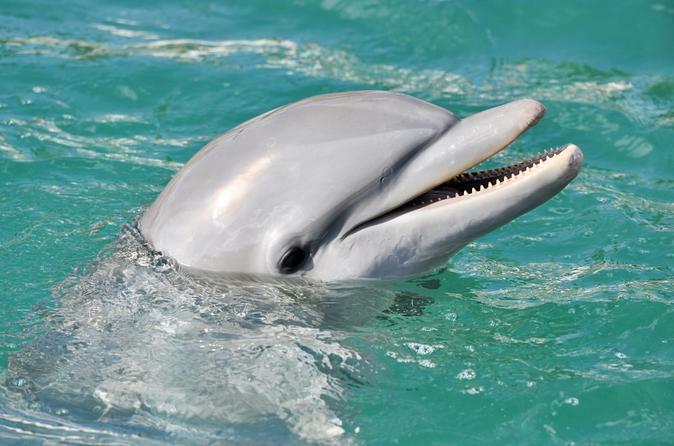 This Florida Aquarium dolphin cruise includes admission to the aquarium itself, with over 20,000 sea creatures, including sharks, otters, alligators and many more.